Many, including St Gemma's own parents, were (and are) unaware that there is another "Saint Gemma" in the Catholic Church. She is Santa Gemma (born 1385-1439) of the Italian mountain village of Goriano Sicoli. Gemma herself was an adult when she first heard of Saint Gemma of Goriano from a Passionist Priest who told her a little bit about her. 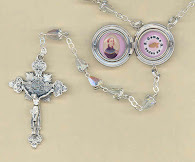 One thing is for sure however -both Saint Gemma's had a strong desire to sacrifice and suffer in reparation for sin and the conversion of sinners. But before we delve into the inspiring life of this "other St. Gemma", perhaps it would be good to give a very brief explanation of the Italian word "Gemma" and is pronunciation. The meaning and pronunciation of the word "Gemma"
Italians pronounce the word Gemma like this: the beginning "Ge" sounds exactly like the word Gee in "Gee, its a nice day" and the "ma" like the ma in the word "machine". So, its "gee-ma" in Italian. Now the word "Gemma" in Italian literally means "Gem", as in gemstone, -a precious stone or jewel. 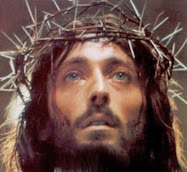 This is why in both Italian and English she is known as the "Gem of Christ" or ""Gemma di Cristo" in Italian. Therefore in English we say it like "gem" as in the word "gemstone" and the "ma" at the end is like in the word "machine", the same as above. So, in short, the difference between the Italian and English pronunciation is a long "e" or a short "e", in Italian Ge like "Jeep" or in English "Gem" like "Gemstone". In the end, however, all will certainly agree that Saint Gemma (or Santa Gemma as the Italians call her) is most certainly a precious Gem of Christ. ~St Gemma Galgani, pray for us! Santa Gemma of Goriano Sicoli, Abruzzo, Italy -The other "Saint Gemma"
Santa Gemma of Goriano Sicoli was born in San Sebastiano to a poor but devout Catholic family in 1385. 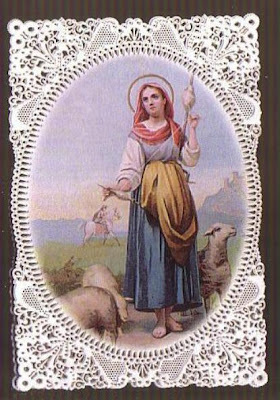 As a young child, her family soon moved to Goriano Sicoli (called at the time Gordianum), where Gemma spent her childhood as a shepherdess, looking after the small flock of sheep that her parents owned. Like St Gemma of Lucca, God had also given her an extraordinary beauty, which was united to virtue and modesty, and her beauty was not an obstacle for her, but a way towards her perfection. One day in 1393, a proud and headstrong Count Ruggieri of Celano saw her and tried to seduce her. She was not frightended and thwarted and reproached him with such strong words that he was ashamed and wanted to make amends for his rude advances. She asked him to build for her an addition to the church of San Giovanni in Goriano Sicoli a poor room with a small window from which she could see the altar, and participate in Holy Mass. 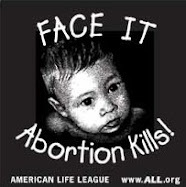 Then, she asked and received permission from her father to live in this little poor room as an anchoress, to pray and expiate and make reparation for her sins, and the sins of others. The local townpeople soon recognised her extraordinary sacrifices and holiness and soon started to go to her for advice of all kinds, and to be guided by "the Santa" as they called her. Living this angelic life of love of God and sacrifice for the following 42 years, she died on May 13, 1439 and at the time of her death bells were heard throughout the valley sounding as if for a great feast. THe local townpeople developed a cult in her honor, and piously remembered the "Virgin of Goriano Sicoli". Because of the devotion of the people, the local Bishop opened her cause for canonisation, and years later her bodily remains were removed in the presence of the Bishop of Sulmona, Guidalotti Perugino. To the amazement of all, her remains were found to be miraculously incorrupt, and all present were edified, and saw it as a sign of God's prescence in "Virgin of Goriano Sicoli." A priveledged sepulchre was built in honor of her inside the church of San Giovanni, and sick people started to go there to be healed. Then in 1613 a church was built in her name over the previous church of San Giovanni, and in 1818 again a new church was completed. 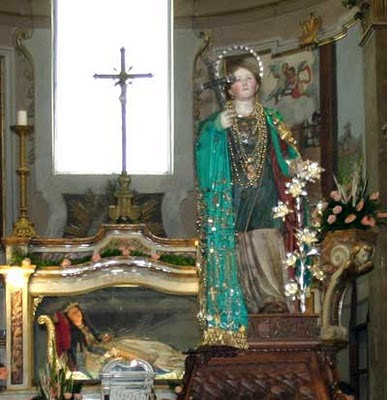 Remarkably the entire town of Goriano Sicoli still celebrates the feast of their patroness Santa Gemma every year with a Triduum on May 11th, 12th and 13th to honor their patron Saint. Because St. Gemma came from the town of San Sebastian, and traveled to the town of Goriano, a few days before her feast celebration the name of a young woman from Goriano is drawn to travel from Goriano to San Sebastian to represent their patron Saint Gemma. The young woman representing Saint Gemma returns to Goriano at on May 11, the beginning of the on her feast celebrations, to the great fanfare and joy of the local townspeople. On that day, all the people from the village walk out of Goriano towards San Sebastian (Santa Gemma's birthplace). They process together down a steep hill to a shrine built to house an image of Santa Gemma; this is the formal meeting place and it is here that the crowd gathers and patiently waits for the other crowd coming from San Sebastian to appear. The special young woman in front of that procession represents Santa Gemma going to Goriano, as in the saint's story. Bells are joyfully rung and the crowds meet and join together in procession, with the young woman in front representing Santa Gemma and her entrance into Goriano. Another part of the annual festival in honor of Santa Gemma of Goriano is where the local women of the village come together in a special house ("the house of Santa Gemma") to spend a whole night collectively baking bread, which is then blessed by the priests and then distributed to all the villagers in the name of Santa Gemma. Interestingly, a local expert on Santa Gemma of Goriano named Christina who has researched the history of the feast and has written about the celebration is the caretaker of a loaf of festival bread dating from 1926, which, she says, is preserved — that is, has not "corrupted," but remains the same. The origins of the bread baking ritual comes from Gemma herself--it is said that certain villagers used to to give Gemma bread (because she was an anchoress who remained always in her little room) and that she in turn often gave this bread to the poor, which was an inspiration to all, and provides the basis for the bread-baking ritual and distibution amongst the community. And finally, to honor the villages patron Saint even more, it has been a long standing tradition in the community to name one's first daughter "Gemma" in honor of the town's patroness, and there is even one girl named Gemma who lives there now (2010) who was even born on the saint's feastday (May 13)! Some or the relatively recent miracles attributed to Santa Gemma is how during World War II a soldier began taking munitions into the church to use it as a base and weapons depot, but he was forced to flee because a young woman suddenly appeared and said, "Go away, this is my house." She was, it is believed, Santa Gemma, for who else could have possibly frightened an armed soldier in such a way? Another time, the front lines were supposed to go through the village, however the townpeople beseeched thier heavenly patroness and two meters of snow fell, saving the town. Again the people gave the credit to Santa Gemma. Recently in April 2009 a strong earthquake hit the Province of L'Aquila in the Abruzzo region. 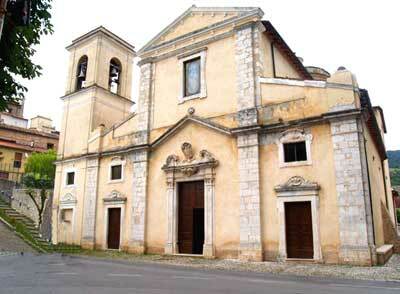 Amazingly, the Church of Santa Gemma and the House of Santa Gemma (where the Santa Gemma bread is made for the triduum festival each year) where by far the worst hit buildings in the village. 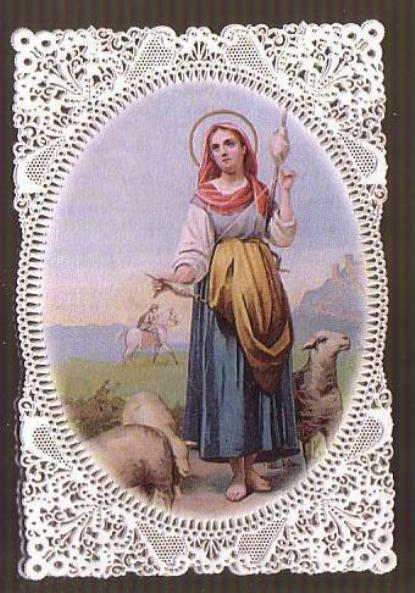 Many of the people of the village beleive that Santa Gemma "took the hit and bore the brunt" of the earthquake for them. I suppose God alone knows whether or not this is true, but nevertheless the devotion of the townspeople to their Patroness is extraordinary, especially for this day and age. -Saint Gemma of Goriano Sicoli, pray for us! 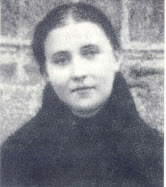 -Saint Gemma Galgani of Lucca, pray for us! Pronounce "Gemma" with short e in both English and Italian (like "Gem," not "Jeep"). Lived in Italy 8 years and am fluent in Italian. Thanks for making this great saint better known! Thanks so much for the clarification on the pronunciation! I sincerely appreciate it. With regards to the pronunciation of the e, I also speak italian and can confirm the same. What the article says is totally incorrect - the "e" sound is practically the same in english. Why hasn't the article been corrected accordingly then? I was born and raised in Goriano Sicoli. Your article concerning the yearly celebration representing the life of Santa Gemma is not correct. 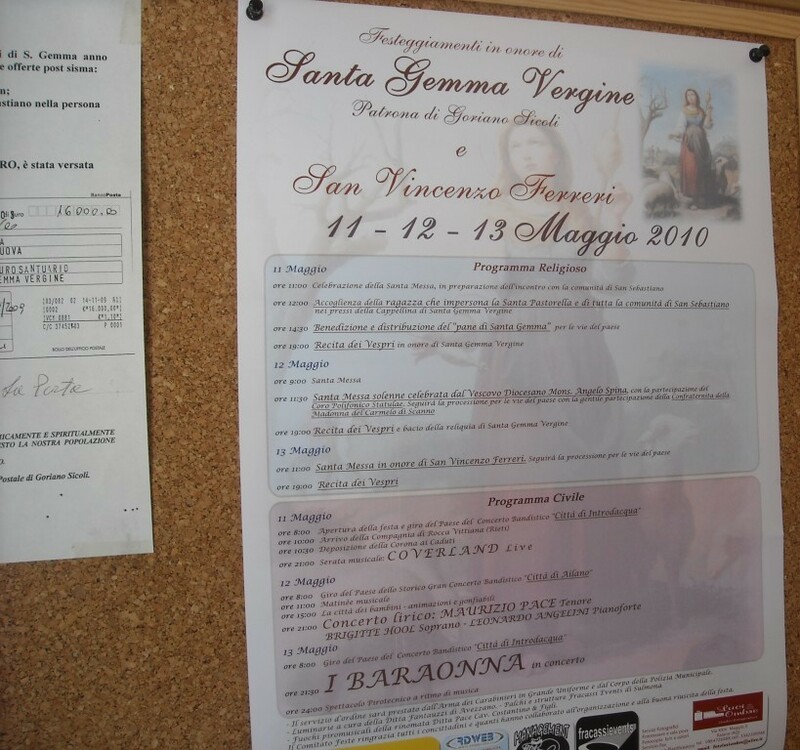 The young woman representing Santa Gemma on May 11th is selected from the town of San Sebastian among the unmarried girls and travels to Goriano Sicoli to meet her Godmother and Godfather (Compari). This re-enactment encounter goes way back to 1939. The young girl selected then was Loreta Ubertini and "i Compari" were Giovanni De Mutiis and Domenica Cifani. This encounter was and still is very emotional and opens the festivities for the celebration.